1 Hour and 55 Minutes of instruction for the small guys! In-depth instruction of the Great 8s which are the keys to unlocking your playing potential as an Undersized. Great conditioning drills with nothing more than a jump rope and basketball(s). Certified as an Advanced Basketball Training DVD. 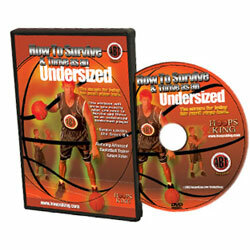 The first and only instructional basketball DVD made for the undersized player.